Thank you for your interest in the Doctor of Physical Therapy Program at Plymouth State University! The Department of Physical Therapy at Plymouth State University will participate in the Physical Therapist Centralized Application Service, known as PTCAS, for the 2018-19 admissions cycle. Applicants applying to the entry-level physical therapist education program for the 2019 entering class will apply online using the PTCAS application. To learn more about PTCAS, visit www.ptcas.org. Visit the Admissions page for more information about requirements and the admissions process, and the Curriculum page to learn more about the program at Plymouth State University. Admission and Matriculation data is presented below. We also encourage you to read through the DPT Student Handbook as a way to orient and information yourself to the PSU DPT Program, there is a “Note to Prospective Students” to help you navigate to the most relevant areas for prospective students. Please visit the Graduate Tuition and Mandatory Fees page for information about the DPT Tuition and Fees (Scroll down to the section specifically for the DPT Program). Prospective students can view the DPT Clinical Education Handbook which contains information regarding the requirements of the full time clinical education experiences such as expectations and student responsibilities. 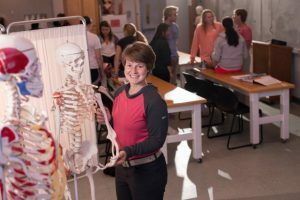 Students interested in becoming a physical therapist are encouraged to visit the American Physical Therapy Association’s web for Prospective Students.